When all the ledgers were finally added up and closed, Rose Valland may have been the most important individual in the French Underground during the Nazi Occupation of France. She succeeded and survived because she worked alone, without instruction. She was a mouse in a museum, a mouse that left no trace to alert mouse catchers. If caught, she would be executed. She worked as an amorphous non-entity in the Paris Jeu de Paume Museum through which the Nazis methodically collected, cataloged, and shipped back to Germany more than 22,000 of the best pieces of stolen art. She kept her hidden, secretive records to herself, and trusted almost no one, even after Paris was liberated. She was not a gem in a well-organized Resistance cell. She took orders from no one, and she passed on what she learned to no one, except when she felt impelled to reveal critical intelligence that required immediate action. My favorites among notable art dealing dynasties were the Gimpels, about whom I have yet to write. The first Gimpel established galleries in Paris and New York. He was responsible for selling much of the art to Henry Walters and Edward Drummond Libbey that later made notable the Walters Museum in Baltimore and the Toledo Museum of Art. I became acquainted with two brothers of the third generation. After World War II, they reestablished the family business in London. Their father had died in the Nazi extermination. Both brothers married French girls who had been active in the Resistance, frequently as couriers but sometimes as transporters of explosives. Capture would have meant quick execution. Like most of the Underground, after the war they did not talk about their exploits, and I can’t fill you with stories. I have written some about Jean Lurçat, a pioneer in the rebirth of French tapestry art. He was a volatile member of a Communist Underground. He escaped capture, but his rural studio was burned by the Nazis. Rose Valland was born in 1898, in Saint-Étienne-des-Saint-Geoirs, a small community between Lyon and Grenoble. Her father was a blacksmith. 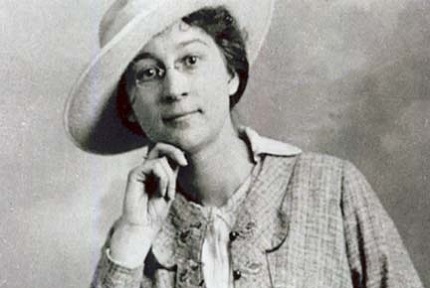 After receiving a scholarship to a teaching school, she finished at the top of her class in 1918. She planned to be an art teacher and enrolled in the Ecole de Beaux-Arts in Lyon, where she again finished at the top of her class. She continued her education at the Ecole Nationale de Beaux-Arts in Paris. After working briefly as a drawing teacher, she pursued art history degrees at the Ecole du Louvre and the Sorbonne. Despite her exemplary education, a paid place for a woman in the museums of pre-WWII France didn’t exist. She breached the gender barrier in 1932 by becoming an unpaid volunteer assistant at the Jeu de Paume Museum on the Place de la Concorde in Paris. She did not become a paid member of the staff until 1941, during the German Occupation. Paris was headquarters for Einsatzsab Reichesteiter Rosenberg (ERR), the avaricious and malicious Nazi apparatus for looting the art treasures of France, facilitated by Herman Göring and a relentless staff that included Hermann Benjes, about whom I wrote last week. The Jeu de Paume museum became the gathering and shipping point for 22,000 works of art that the Nazis plundered from French Jews and other sources. Germans have long been noted for their genius in keeping records and categorizing data. They kept meticulous accounts of the sources of their plundered loot, its arrival at the Jeu de Paume, and where each piece was shipped. For four years Rose Valland was the nondescript spinster in the middle of this headquarters of theft. No one paid much attention to her as she went about doing what was asked of her. But, as meticulous as the Germans, she was vigilantly going about her own clandestine work. She was keeping detailed records of every piece of art that the Germans brought to the museum and the shipping details of where it was sent. She did not pass this information on to anyone. No one could have used it. Not yet. In that suspicious atmosphere she was sometimes barred from the museum, accused of “spying, stealing, or sabotage,” but she always argued back against the German manipulators and regained her position. She was too insignificant to fuss over, and, a member of the museum staff, she was useful in the unimportant work she was doing for them. In 1944, months before Allied forces landed in Normandy, Bruno Lohse, “a slick, reptilian German art dealer” who was profiting by the Nazi seizures, discovered her trying to figure out a German address on some shipping documents. He warned her she could be shot for such indiscretion. Maybe he was just teasing a mouse, but she felt he was her most dangerous enemy. Valland knew that Lohse was stealing art from the stealers. Perhaps he did not report her indiscretion because he knew she could denounce him. Her subversiveness was helped because she did not let her Germans know she spoke their language. She listened to their conversations. They missed their most important adversary. She knew where the dispatched spoils could be found. Or, at least where they were headed when they left for Germany. At the Jeu de Paume, there was a panicked, haphazard, last-minute packing of looted masterpieces. Valland learned that the trucks were headed towards the rail station at Aubervilliers in the Paris outskirts. There the art was loaded into five sealed railcars. But the train did not leave immediately, as it waited for the arrival of 46 additional cars of booty looted from other sources. The train, #49,044, did not move for several days. Valland had copied the shipment orders, knew exactly where the train was supposed to go. This time she passed on the details to her boss, and the French Resistance intervened to keep the train from rumbling on to Germany. Valland wrote about the incident in her book Le Front de l’Art, which became the source for The Train, the dramatic 1964 black and white motion picture starring Burt Lancaster, Paul Scofield, and Jeanne Moreau. Although her boss at the Louvre, Jacques Jaujard, 49, knew what she had been doing, she was not quick to reveal what she knew to the liberators and the Monuments Man working from Paris, James Rorimer, portrayed as the lead character by George Clooney in The Monuments Men. During the earlier Civil War in Spain, which brought many non-Spaniards to fight on both sides, Jaujard had participated in the secreting and saving of art treasures from Madrid’s great Prado Museum. 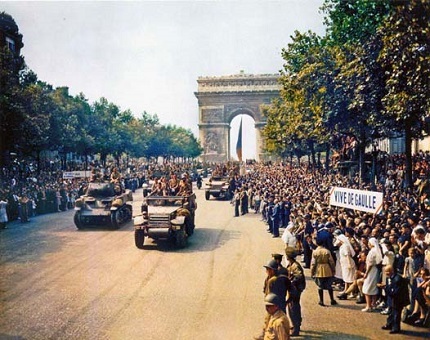 On 25 August 1944, the French took back their capital and their government. But that didn’t mean Rose Valland was ready to come out of the shadows. Rose had had experiences with French bureaucracy and didn’t know whom to trust among the liberators. In the mishmash of new government, some of the participants were incompetents, others jockeys for position and influence. Many were rabidly intent on cleansing the country of collaborators. American publications were replete with pictures of French women whose heads were shaved bare by patriotic French because of fraternization with Nazis. Some suffered worse fates. Might someone accuse her? She had gone through four years of very secretive work, and it was hard to break the pattern. The nature of what she knew — and hence, its details — she kept to herself. She didn’t trust Rorimer. She wasn’t telling anybody much of anything.